This little beauty is much beloved by me. I have a friend having a baby girl in the fairly near future. A friend who is modern, stylish, and generous. 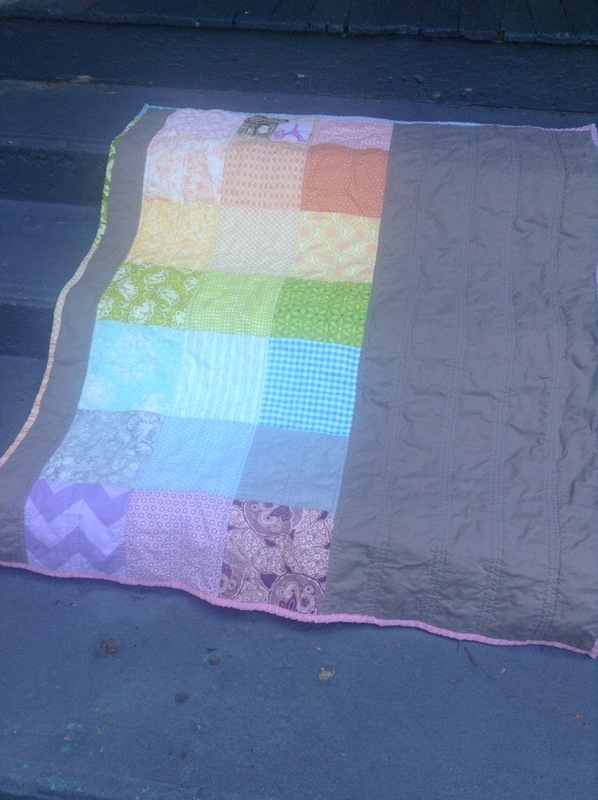 I hoped that my love of pastel rainbows could translate into a lovely quilt for her. 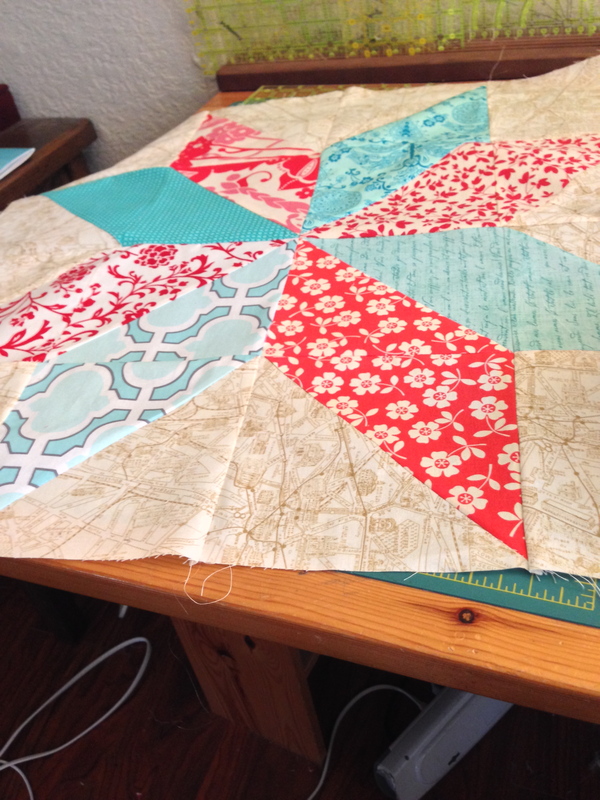 I started the quilt for her using a quarter-circle block, aiming for a modern drunkard’s path. but it didn’t look quite right. So I quickly switched to large blocks in pastel rainbow color order. Paired with Kona Smoke (my favoritest solid gray), this was a quick finish and checked all the boxes for me (and I hope my friend). I took a bit of time with the quiliting – really trying to get my stitches straight in groups of three lines across the quilt. I used a scrappy rainbow binding to finish. And I finished the binding by machine and didn’t cry or whine. Woot! 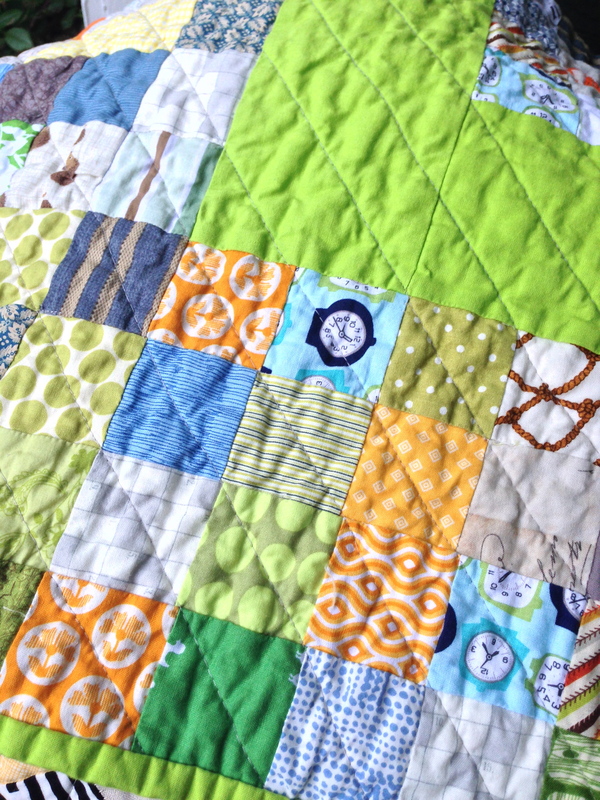 I backed the quilt in an adorable nursery print from JoAnn that I fell in love with. 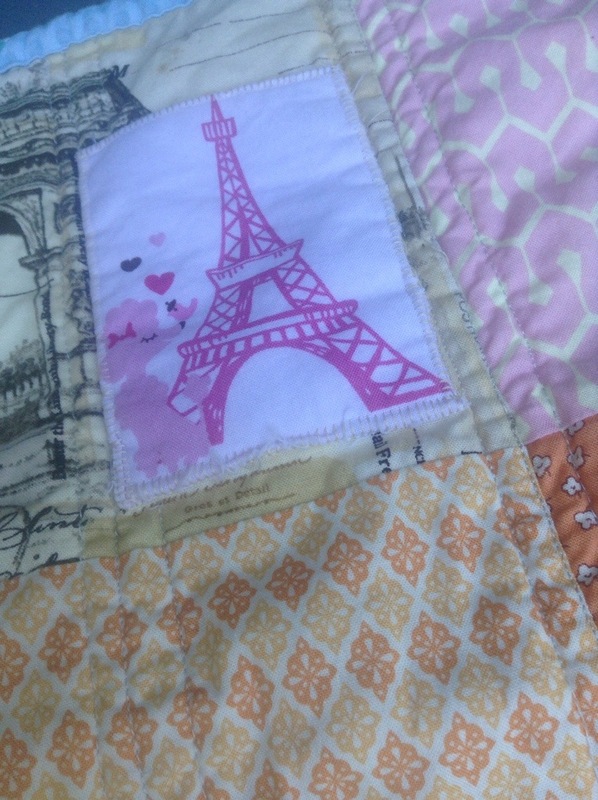 I appliqued a little rectangle of the print on top of this Paris Postcard fabric. 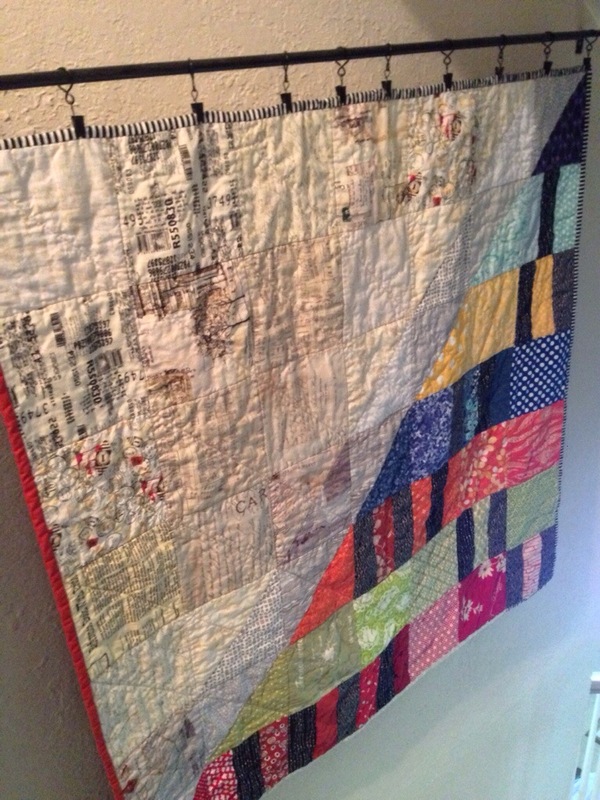 I really love it and gives the simple quilt a little something more. These pictures look so dreamy – I am not sure why… I didn’t use a filter and I took them during the day. Must be the magic of the pastel rainbow. Lately when I am feeling a bit down, I search for pastel rainbows in Instagram or Pinterest. They really are gorgeous. And lift my spirits. I am not done with pastel rainbows yet. 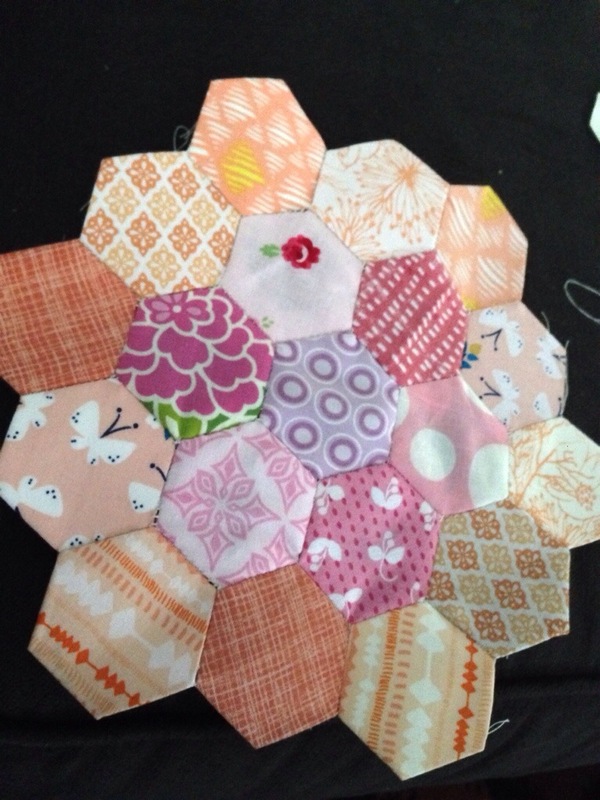 I started this little hexie project. I am planning on making a pillow for my bedroom, but it may turn into a whole pastel rainbow quilt. Now that would keep me busy. I still want to sew all of the things. 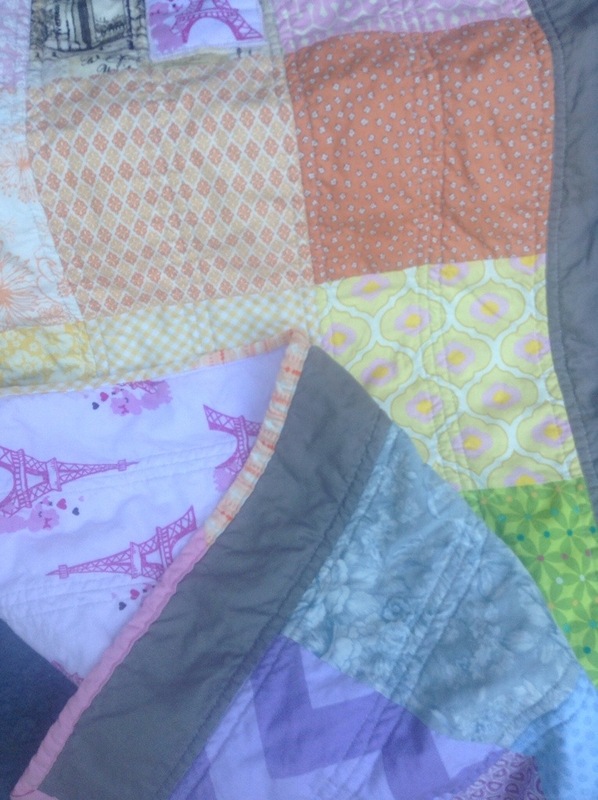 My house is filled with quilty stuff, almost all my friends who have a baby or a toddler girl has a quilt. But I want more actual snuggly quilts around the house. And to replace the wall hanging in the living room. And… well, there is a lot. Did I mention I want to sew all the things? I have 16 WIPs / not quite started projects that I want to finish by the end of the year. All while fighting the urge to scrap it all (pun intended) and make Christmas quilts. In the last three weeks I have completed 4 WIPs – which I am *very* happy about. But have also added 3 things to my to-do list. Sigh. 1. 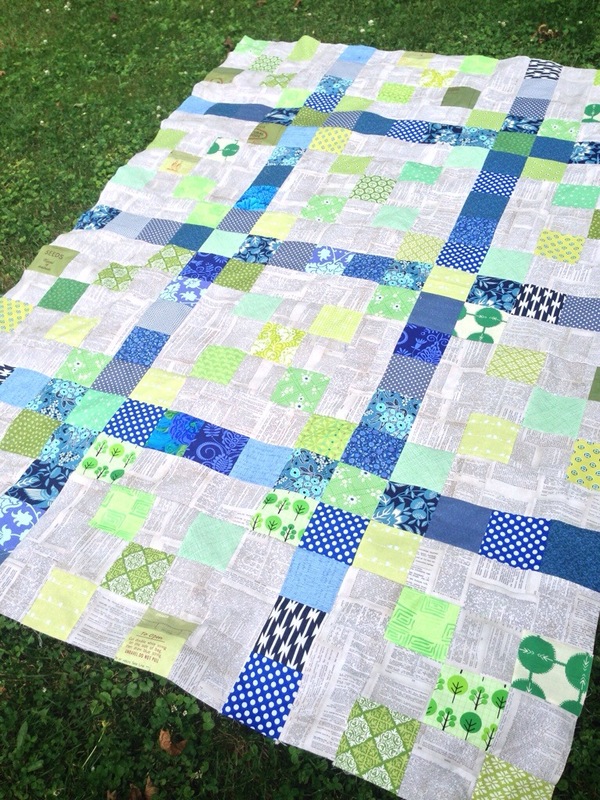 Irish Chain Interrupted… top finished, backing purchased – just need to have enough $ on hand to send to Missouri Start Quilt Co for quilting. I want something more than in-the-ditch for this one because I like it so much. 2. 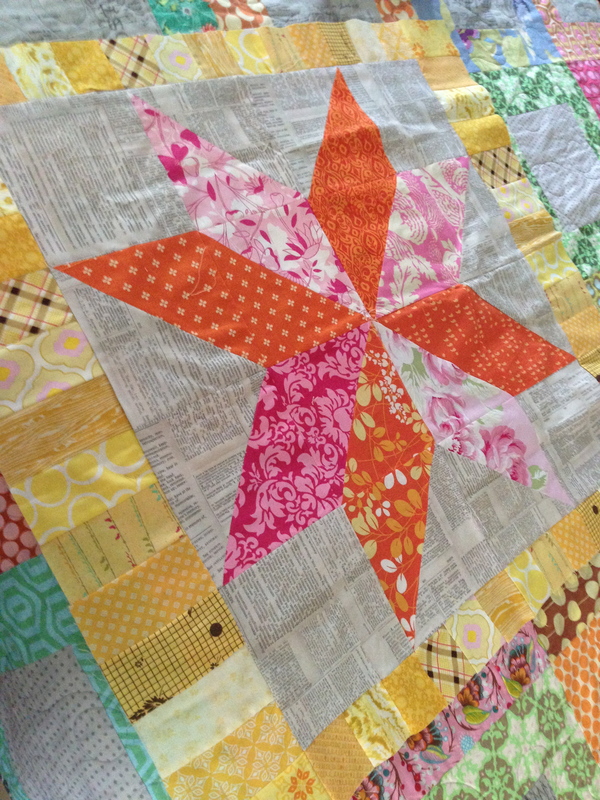 Warm Star Charity Quilt… This was made during the time I was obsessed with 8-point stars and warm colors + grey. That obsession left as quickly as it came and this block was abandoned. Last weekend I finished the borders and quilted. 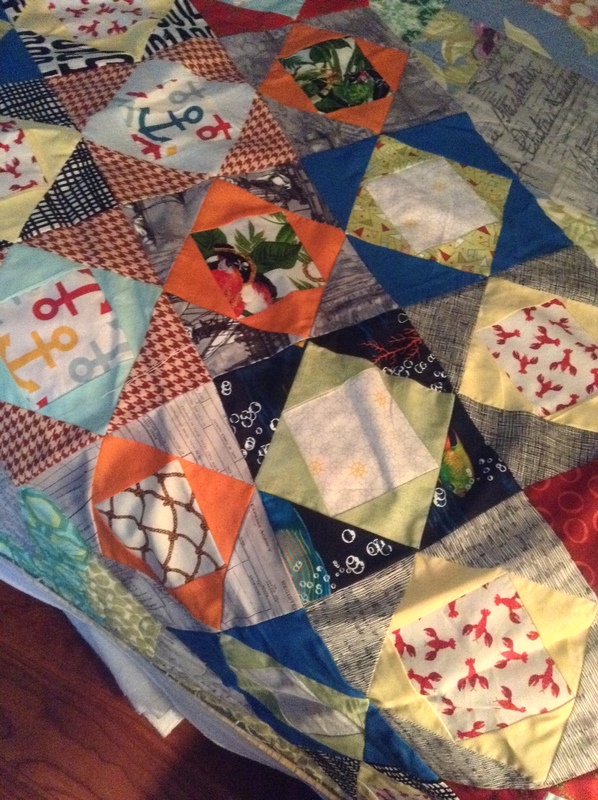 I just need to zip down the binding and it will be a baby quilt ready for Project Linus. I used this gorgeouse DSQuilts backing on this quilt. Luckily, I still have lots. This is one of my favoritest fabrics ever. 3. 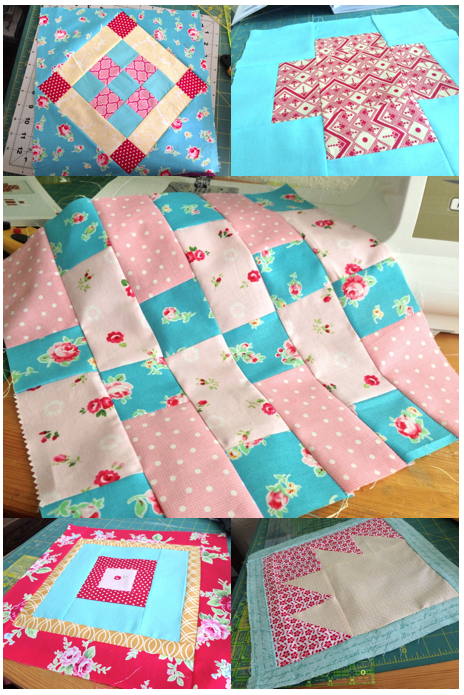 Bluebird Park Charity Quilt… Sigh…. this thing. 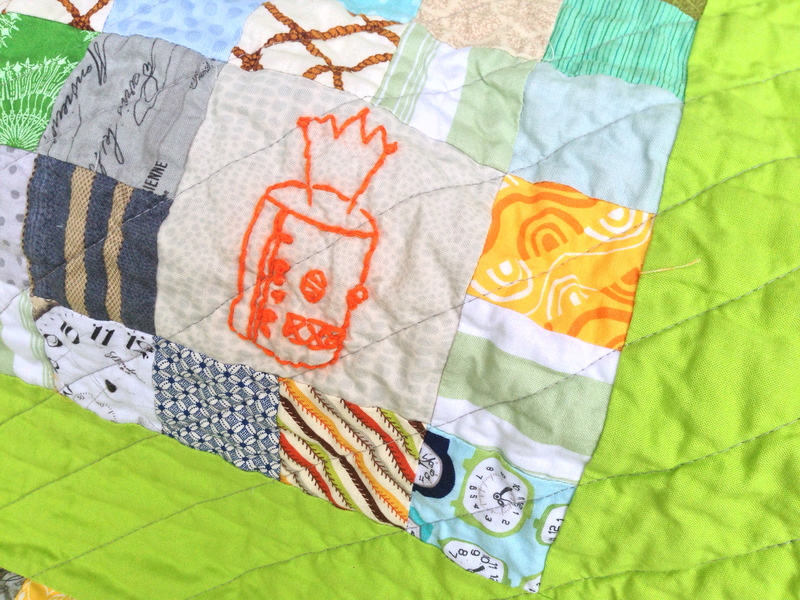 I made this baby quilt for a friend and then decided it was too girly for a baby boy. So I made her something else and set this aside. This is my longest lingering WIP. I really should finish it this weekend so I can donate it to Project Linus. I just don’t like it and don’t want to work on it. Waah. But it would be *so* satisfying to have this one done, for sure. 4. 5. 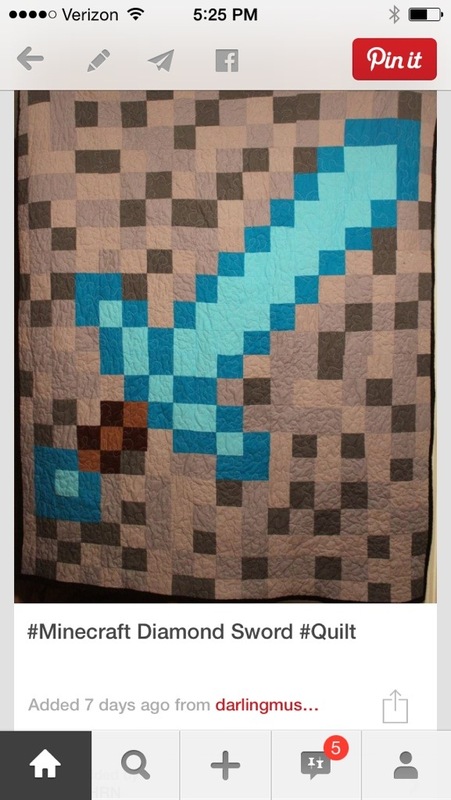 Minecraft Diamond Sword… This should be very easy to knock out and would make the daughter of a dear friend really happy. I bought the solids, have a pattern… just need to get to it. 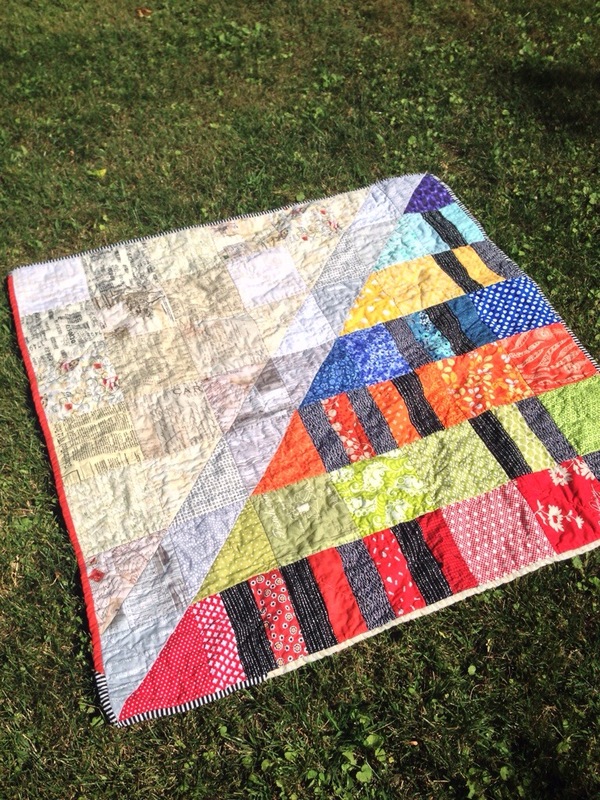 Most likely will start as a reward for finishing the Bluebird Park quilt. 6. Blue and blue and blue HST quilt… This would be for the *other* daughter of my friend. 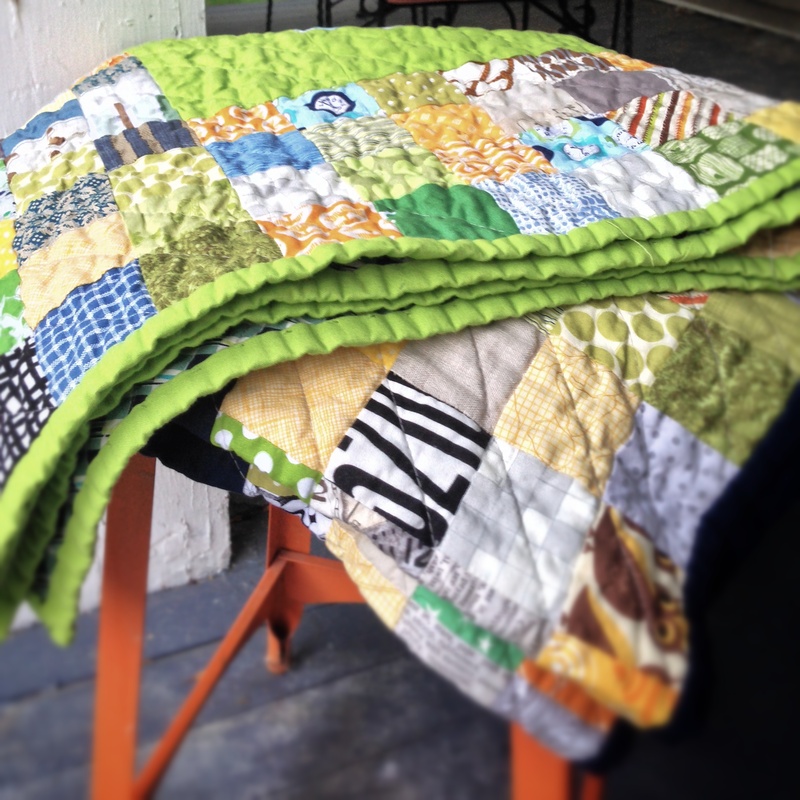 I have designed this quilt in my mind and I LOVE it. Getting to work on this will be motivation to power through some WIPs. I bought some awesome HST paper piecing sheets to use on this one. Let’s see if they make HSTs less time consuming? 7. 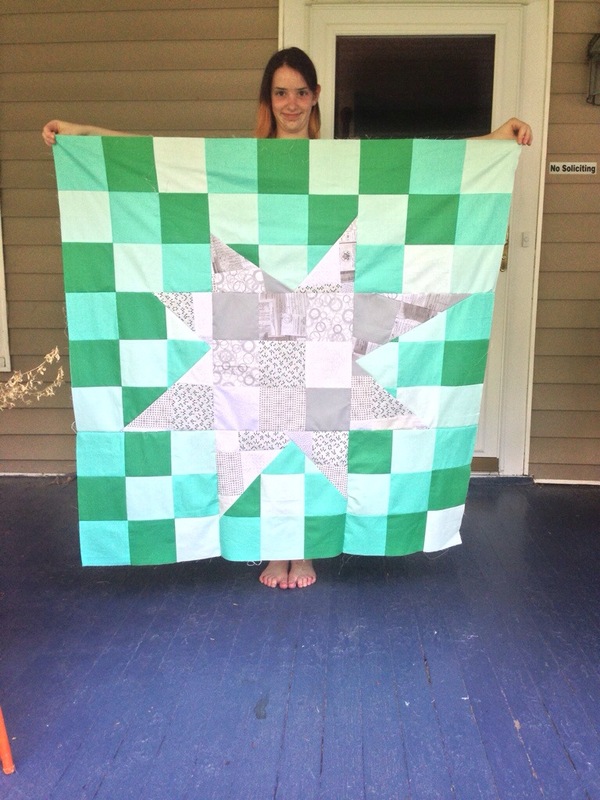 Teal Star Charity Quilt… This is the awesome quilt top I made in class with the awesome Vanessa. Love this so much and could make more and more and more. This one I will finish for Project Linus. Just quilting and binding left. 8. 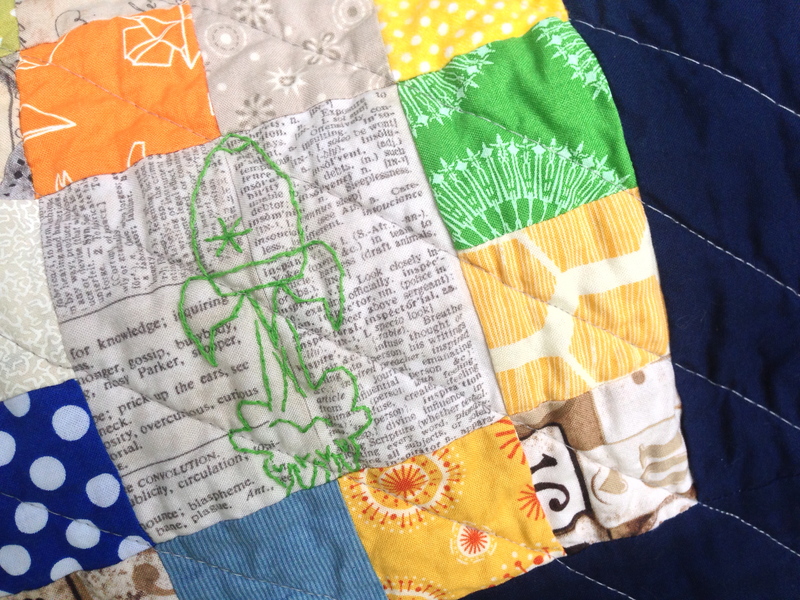 Pirate Economy Block Charity Quilt… I loved this when I started it and now really don’t like it. Too weird looking. But I have purchased backing for it twice (yes, really). And I think it would make a cute quilt for a baby boy. really. So I will finish it. All the blocks are done, just need to wrap it up. 9-13. Lots and lots and lots of red/pink/aqua orphan blocks… I got so sick of making these for a sampler quilt for me – because I realized that a bunch of random blocks a cute quilt does not make. 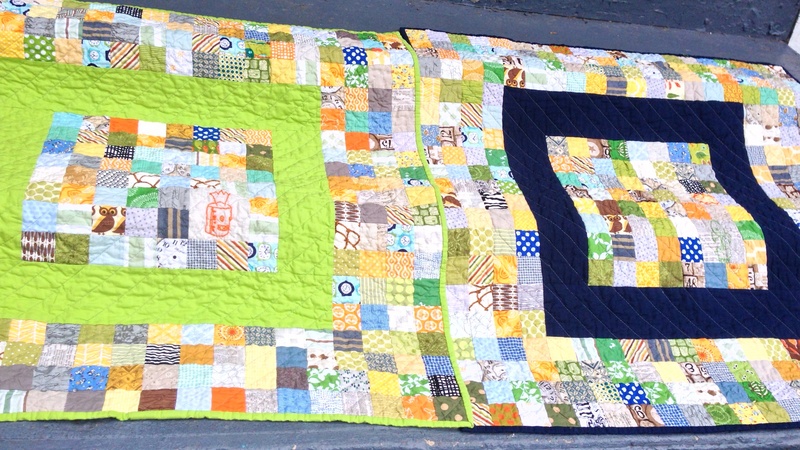 So I am going to add lots of borders and split them up into 4 Project Linus quilts. And I learned my lesson. 14. SD’s Brick Quilt… Of all of the red/pink/aqua blocks I made, I loved this one best of all. So I started on making a quilt for my stepdaughter that uses this block throughout. This will let me use a lot of lovely low-volume prints and bright pops of her favorite colors. 15. 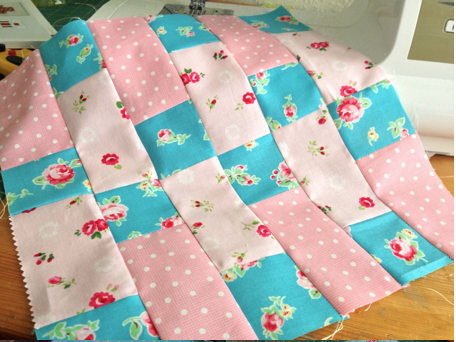 Up Parasol Windmills… Oh my do I love this fabric. A LOT. I started making some windmill blocks and want to make a quilt using the windmills and one of the cool settings from the Modern Vintage Quilts book. 16. Gypsy Wife… It is hard to call this a WIP, I only have a handful of blocks made and I will probably want to remake them now that my stash is so much stashier. 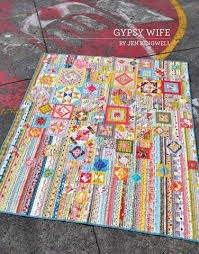 I really love this quilt and want one of my very own. 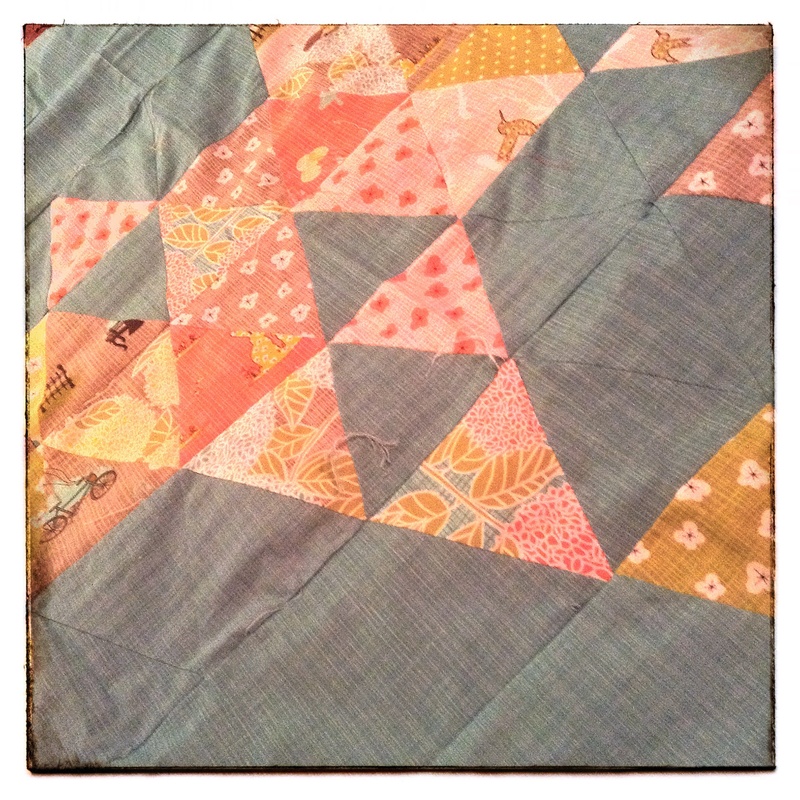 So my pledge to myself is to finish all of the list above, and then take my time enjoying making this quilt. Knock on wood. I envisioned little blue, orange, yellow, and green squares, with a healthy mix of low volume. 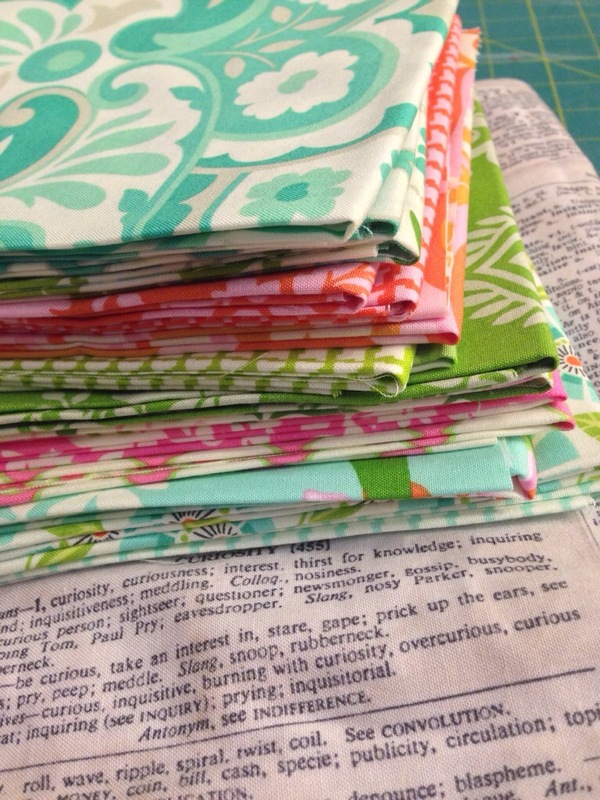 I started to tot up the number of 2″ squares needed for 2 40″ square quilts and got a bit scared. In the design in my mind, I added a 4″ border around the center 64 patch. I thought all of this in about 15 minutes at 8:30 am at work. Ugh. Don’t you hate that? You have an idea and it is hours, if not days, before you can get started? I hate that. 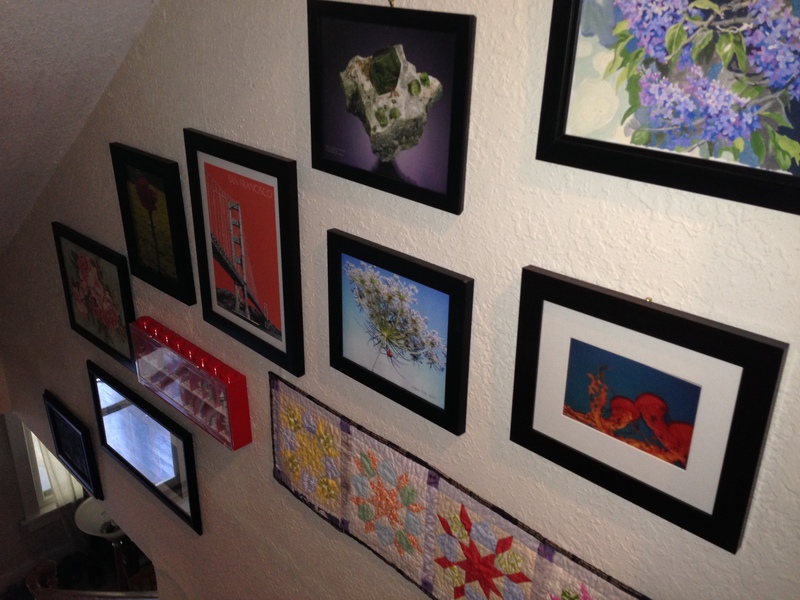 But when I got home, I dove into my scrap piles and started cutting. 632 squares. I haven’t done a scrap project before, and it was fun to dive into the past. 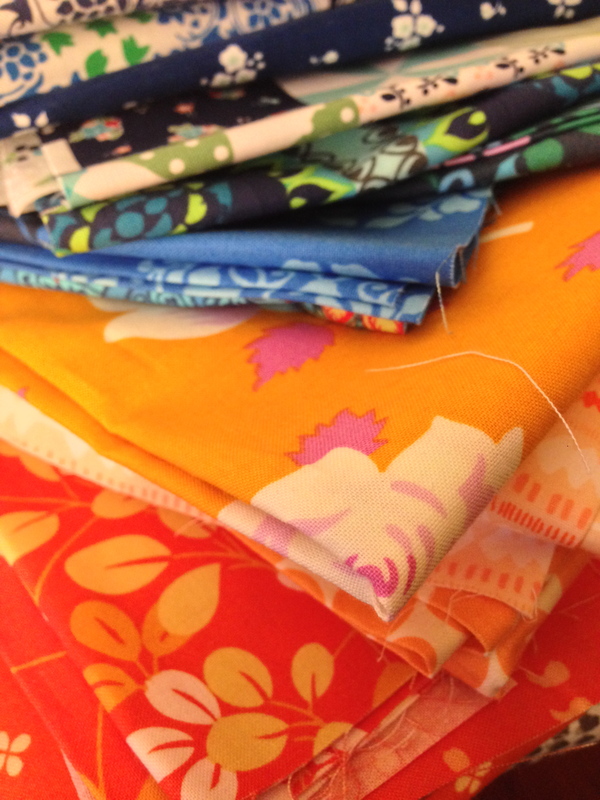 And I had lots of scraps of cute fabrics. And I am learning what sizes of scraps are worth keeping and what isn’t worth keeping. I had embroidered a rocketship for a reason I don’t completely remember. And so I put it in my center panel, and one evening while watching TV with DH, I embroidered a robot. Not as cute as the rocketship, but OK. I used two different awesome DSQuilts fabrics for the backings, with a strip of Kona Navy in one and a strip of Kona Chartreuse in the other. I used the same Kona for the binding. 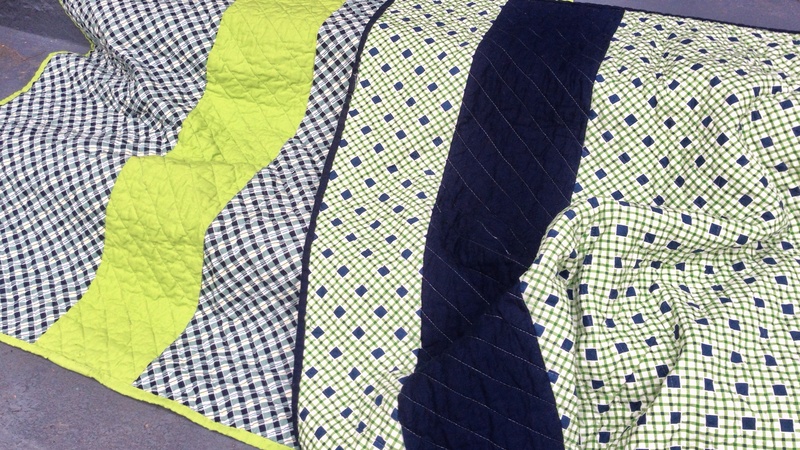 I quilted these simply (of course) – straight diaganol lines in a medium grey. This project was A LOT of work. Lots of cutting, lots of piecing. Like LOTS. But I absolutely love the result. The little squares of adorable fabric made slightly more modern with the solids really makes me happy. I want to make a ton more of these. And, coincidentally, I have lots of scraps. My friend (the recipient) has become too uncomfortable to come into work, so I will be mailing it to her this weekend – I so hope she loves it as much as I do. Linking to Amanda Jean for Finish It Up Friday. Woot.